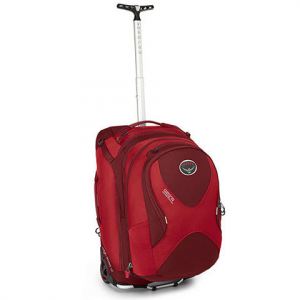 The Osprey Ozone Convertible 22" Travel Bag features a High Load chassis with large wheels and a whopping 50 liters of storage space for life on the go. It is equipped with shoulder straps and a ventilated back panel in case you need to "put the team on your shoulders" and navigate tight spaces and rough terrain. A detachable daypack outfitted with a large main compartment and internal organization allows you to set up a base camp and venture out carrying only what you need for the day. Safe travels!